September 28, 2009 - Mac Mellor writing - [According to the 1960 Tent List] Group 5 = Tent 14, 1960. Andy Astmann writing - As soon as I stopped trying to remember his name, I remembered his name: the local guy was named Peter Gould. Andy Astmann writing - Trust me, it's John Gilmore. I think he's now an attorney in Boston. I ran into him in Boston, circa 1972. I also kept in touch with John Diamond for many years. He was then a stockbroker in Washington, D.C., living, I think, in Maryland. John Mercer writing - Well, I had the Andy right, Andy. Good to hear from you. Interesting call on John Gilmore, but it still looks like Jamie Flowers to me. But, hell, you were in the tent. Andy Astmann writing - Febuary 2008 - I think the first guy on the left is John Gilmore, the next guy was a local kid, and the third one is me, Andy Astmann. 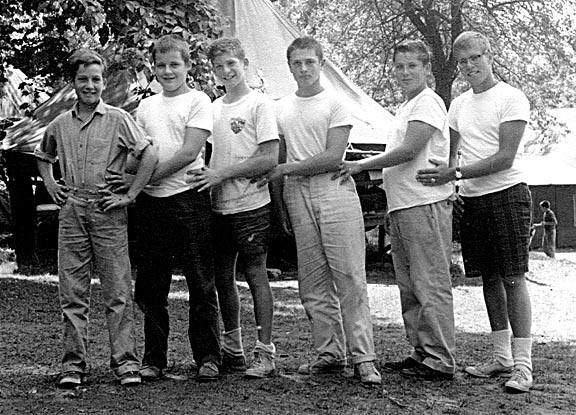 July 2, 2003 -- John Hendee writing -- camp councilor-far right is the one and only John Hendee-camper/councilor from 1950-1960. Left to right: John Gilmore, Peter Gould, Andy Astmann, Scott Carlton, Daryl Young, John Hendee.